For the genus of perennial herbs in the nightshade family, see Chamaesaracha. "FVEY" redirects here. For the album by Shihad, see FVEY (album). 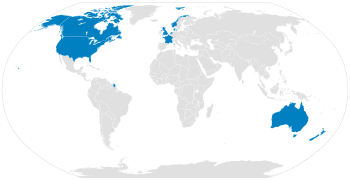 The origins of the FVEY can be traced back to the post–World War II period, when the Atlantic Charter was issued by the Allies to lay out their goals for a post-war world. During the course of the Cold War, the ECHELON surveillance system was initially developed by the FVEY to monitor the communications of the former Soviet Union and the Eastern Bloc, although it is now used to monitor billions of private communications worldwide. In the late 1990s, the existence of ECHELON was disclosed to the public, triggering a major debate in the European Parliament and, to a lesser extent, the United States Congress. As part of efforts in the ongoing War on Terror since 2001, the FVEY further expanded their surveillance capabilities, with much emphasis placed on monitoring the World Wide Web. The former NSA contractor Edward Snowden described the Five Eyes as a "supra-national intelligence organisation that does not answer to the known laws of its own countries". Documents leaked by Snowden in 2013 revealed that the FVEY have been spying on one another's citizens and sharing the collected information with each other in order to circumvent restrictive domestic regulations on surveillance of citizens. In spite of continued controversy over its methods, the Five Eyes relationship remains one of the most comprehensive known espionage alliances in history. Since processed intelligence is gathered from multiple sources, the intelligence shared is not restricted to signals intelligence (SIGINT) and often involves defence intelligence as well as human intelligence (HUMINT) and geospatial intelligence (GEOINT). The following table provides an overview of most of the FVEY agencies involved in such forms of data sharing. The cover page of the first version of the secret UKUSA Agreement in 1946, which was disclosed to the public in 2011. 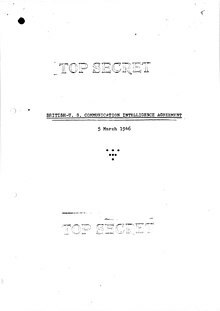 The origins of the Five Eyes alliance can be traced back to the Atlantic Charter, which was issued in August 1941 to lay out the Allied goals for the post-war world. On 17 May 1943, the British–U.S. Communication Intelligence Agreement, also known as the BRUSA Agreement, was signed by the UK and U.S. governments to facilitate co-operation between the U.S. War Department and the British Government Code and Cypher School (GC&CS). On 5 March 1946, the secret treaty was formalized as the UKUSA Agreement, which forms the basis for all signal intelligence cooperation between the NSA and GCHQ to this day. At this time only Canada, Australia and New Zealand will be regarded as UKUSA-collaborating Commonwealth countries. The "Five Eyes" term has its origins as a shorthand for a "AUS/CAN/NZ/UK/US EYES ONLY" (AUSCANNZUKUS) classification level. During the Cold War, GCHQ and the NSA shared intelligence on the Soviet Union, the People's Republic of China, and several eastern European countries (known as Exotics). Over the course of several decades, the ECHELON surveillance network was developed to monitor the military and diplomatic communications of the Soviet Union and its Eastern Bloc allies. During the Vietnam War, Australian and New Zealand operators in the Asia-Pacific region worked directly to support the United States, while GCHQ operators stationed in the (then) British colony of Hong Kong were tasked with monitoring North Vietnamese air defence networks. During the Falklands War, the British received intelligence data from its FVEY allies such as Australia, as well as from third parties such as Norway and France. In the aftermath of the Gulf War, a technician of the ASIS was used by SIS to bug Kuwaiti government offices. In the 1950s, SIS and the CIA jointly orchestrated the overthrow of Iran's Prime Minister Mohammad Mosaddegh. In the 1960s, SIS and the CIA jointly orchestrated the assassination of the Congolese independence leader Patrice Lumumba. In the 1970s, the ASIS and the CIA jointly orchestrated the overthrow of Chile's President Salvador Allende. During the Tiananmen Square protests of 1989, SIS and the CIA took part in Operation Yellowbird to rescue dissidents from the Chinese regime. By the end of the 20th century, the ECHELON surveillance network had evolved into a global system capable of sweeping up massive amounts of private and commercial communications, including telephone calls, fax, e-mail and other data traffic. This was done through the interception of communication bearers such as satellite transmission and public switched telephone networks. The Five Eyes has two types of information collection methods: the PRISM program and the Upstream collection system. The PRISM program gathers user information from technology firms such as Google, Apple and Microsoft, while the Upstream system gathers information directly from the communications of civilians via fiber cables and infrastructure as data flows past. In 1988, Duncan Campbell revealed in the New Statesman the existence of ECHELON, an extension of the UKUSA Agreement on global signals intelligence [Sigint]. The story, 'Somebody's listening,' detailed how the eavesdropping operations were not only being employed in the interests of 'national security,' but were regularly abused for corporate espionage in the service of US business interests. The piece passed largely unnoticed outside of journalism circles. In 1996, a detailed description of ECHELON was provided by New Zealand journalist Nicky Hager in a book titled "Secret Power – New Zealand's Role in the International Spy Network", which was cited by the European Parliament in a 1998 report titled "An Appraisal of the Technology of Political Control" (PE 168.184). On 16 March 2000, the Parliament called for a resolution on the Five Eyes and their ECHELON surveillance network, which, if passed, would have called for the "complete dismantling of ECHELON". Three months later, the Temporary Committee on ECHELON was set up by the European Parliament to investigate the ECHELON surveillance network. However, according to a number of European politicians such as Esko Seppänen of Finland, these investigations were hindered by the European Commission. In the United States, congressional legislators warned that the ECHELON system could be used to monitor U.S. citizens. On 14 May 2001, the U.S. government cancelled all meetings with the Temporary Committee on ECHELON. According to a BBC report in May 2001, "the US Government still refuses to admit that Echelon even exists." In the aftermath of the September 11 attacks on the World Trade Center and the Pentagon, the surveillance capabilities of the Five Eyes were greatly increased as part of the global War on Terror. During the run-up to the Iraq War, the communications of UN weapons inspector Hans Blix were monitored by the Five Eyes. The office of UN Secretary-General Kofi Annan was bugged by British agents. An NSA memo detailed plans of the Five Eyes to boost eavesdropping on UN delegations of six countries as part of a "dirty tricks" campaign to apply pressure on these six countries to vote in favour of using force against Iraq. SIS and the CIA forged a surveillance partnership with Libya's ruler Muammar Gaddafi to spy on Libyan dissidents in the West, in exchange for permission to use Libya as a base for extraordinary renditions. As of 2010[update], the Five Eyes also have access to SIPRNet, the U.S. government's classified version of the Internet. In March 2014, the International Court of Justice (ICJ) ordered Australia to stop spying on East Timor. This marks the first time that such restrictions are imposed on a member of the FVEY. The Five Eyes alliance is sort of an artifact of the post World War II era where the Anglophone countries are the major powers banded together to sort of co-operate and share the costs of intelligence gathering infrastructure. … The result of this was over decades and decades some sort of a supra-national intelligence organisation that doesn't answer to the laws of its own countries. In recent years, documents of the FVEY have shown that they are intentionally spying on one another's citizens and sharing the collected information with each other in order to circumvent restrictive domestic regulations on spying. Shami Chakrabarti, the director of the advocacy group Liberty, claimed that the FVEY alliance increases the ability of member states to "subcontract their dirty work" to each other. 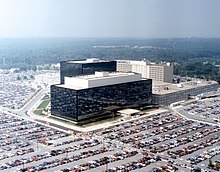 The former NSA contractor Edward Snowden described the FVEY as a "supra-national intelligence organisation that doesn't answer to the laws of its own countries". Canada: In late 2013, Canadian federal judge Richard Mosley strongly rebuked the CSIS for outsourcing its surveillance of Canadians to overseas partner agencies. A 51-page court ruling asserts that the CSIS and other Canadian federal agencies have been illegally enlisting FVEY allies in global surveillance dragnets, while keeping domestic federal courts in the dark. New Zealand: In 2014, the NZSIS and the GCSB of New Zealand were asked by the New Zealand Parliament to clarify if they had received any monetary contributions from members of the FVEY alliance. Both agencies withheld relevant information and refused to disclose any possible monetary contributions from the FVEY. David Cunliffe, leader of the Labour Party, asserted that the public is entitled to be informed. European Union: In early 2014, the European Parliament's Committee on Civil Liberties, Justice and Home Affairs released a draft report which confirmed that the intelligence agencies of New Zealand and Canada have cooperated with the NSA under the Five Eyes programme and may have been actively sharing the personal data of EU citizens. Since the addition of two members in 1956, the specific Five Eyes consist of Australia (accepted 1956), Canada (accepted 1948), New Zealand (accepted 1956), the United Kingdom (co-creator 1946), and the United States (co-creator 1946). Further, there is a group of nations termed '3rd Party Partners', which share their intelligence with the 5 Eyes. While the Five Eyes is a very specific agreement with specific operations amongst the five nations, other non-FVEY sharing agreements have been set up independently and for specific purposes. For example, according to Edward Snowden, the NSA has a "massive body" called the Foreign Affairs Directorate that is responsible for partnering with foreign countries. According to the news magazine L'Obs, in 2009, the United States proposed to France to join the Five Eyes, that would then have become the "Six Eyes". Nicolas Sarkozy however made the requirement to be granted the same status as other allies, including the signing of a "no-spy agreement". This requirement was approved by the director of the NSA, but not by the director of the CIA, and furthermore not by President Barack Obama, resulting in a refusal from France. In 2013 it was reported that Germany was interested in joining the Five Eyes alliance. At that time, several members of the United States Congress, including Tim Ryan and Charles Dent, were pushing for Germany's entrance to the Five Eyes alliance. Israel, Singapore and Japan are collaborating with Five Eyes. The Nine Eyes is a different arrangement that consists of the same members of Five Eyes working with Denmark, France, the Netherlands and Norway. According to a document leaked by Edward Snowden, there is another working agreement amongst 14 nations officially known as SIGINT Seniors Europe, or "SSEUR". These "14 Eyes" consist of the same members of Nine Eyes plus Belgium, Germany, Italy, Spain and Sweden. As the surveillance capabilities of the FVEY continue to increase to keep up to pace with technological advancements, a global surveillance system has been gradually developed to capture the communications of entire populations across national borders. The following list contains a handful of targets of the FVEY who are public figures in various fields. In order for a person to be included in the list, there must be well-documented evidence based on reliable sources, such as leaked or declassified documents or whistleblower accounts, which demonstrate that the person involved is, or was, intentionally targeted for FVEY surveillance. ^ a b c Cox, James (December 2012). "Canada and the Five Eyes Intelligence Community" (PDF). Canadian Defence and Foreign Affairs Institute. ^ "Five Eyes". United States Army Combined Arms Center. Archived from the original on 2 February 2014. Retrieved 18 January 2014. ^ "PKI Interoperability with FVEY Partner Nations on the NIPRNet". United States Department of the Navy. Archived from the original on 1 February 2014. Retrieved 18 January 2014. ^ Asser, Martin (6 July 2000). "Echelon: Big brother without a cause?". BBC. Retrieved 28 January 2014. ^ "Q&A: What you need to know about Echelon". BBC News. 29 May 2001. Retrieved 28 January 2014. ^ a b c "Snowden-Interview: Transcript". Norddeutscher Rundfunk. 26 January 2014. Retrieved 28 January 2014. ^ a b Ball, James (20 November 2013). "US and UK struck secret deal to allow NSA to 'unmask' Britons' personal data". The Guardian. Retrieved 18 January 2014. ^ a b MacAskill, Ewen (2 December 2013). "Revealed: Australian spy agency offered to share data about ordinary citizens". The Guardian. Retrieved 18 January 2014. ^ a b Watt, Nicholas (10 June 2013). "NSA 'offers intelligence to British counterparts to skirt UK law'". The Guardian. Retrieved 19 January 2014. ^ a b British spy agency taps cables, shares with U.S. NSA – Guardian, Reuters, 21 June 2013. Retrieved 18 January 2014. ^ Perry, Nick (16 July 2013). "Experts say US spy alliance will survive Snowden". Associated Press. Retrieved 25 June 2015. ^ Farrell, Paul (2 December 2013). "History of 5-Eyes – explainer". The Guardian. Retrieved 27 January 2014. ^ a b c Norton-Taylor, Richard (25 June 2010). 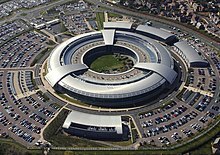 "Not so secret: deal at the heart of UK-US intelligence". The Guardian. Retrieved 27 January 2014. ^ Cox, James (December 2012). "Canada and the Five Eyes Intelligence Community" (PDF). Canadian Defence and Foreign Affairs Institute. Archived from the original (PDF) on 2013-12-04. ^ Aldrich, Richard (24 June 2010). "Allied code-breakers co-operate – but not always". The Guardian. Retrieved 25 June 2010. ^ a b "Q&A: What you need to know about Echelon". BBC. 29 May 2001. ^ Campbell, Duncan (25 July 2000). "Inside Echelon". Heise Online. Retrieved 19 December 2013. ^ Jones, George (13 Mar 2002). "How France helped us win Falklands war". The Daily Telegraph. ^ a b Milliken, Robert (23 February 1994). "Canberra spy link to MI6 alleged". The Independent. ^ "Norsk lyttestasjon viktig brikke i Falklandskrigen" (in Norwegian). Norwegian Broadcasting Corporation. 21 May 2002. Archived from the original on 29 June 2009. ^ Sanchez, Raf (19 August 2013). "British diplomats tried to suppress details of SIS role in Iran coup". The Daily Telegraph. Retrieved 27 January 2014. ^ Risen, James (16 April 2000). "Secrets Of History: The C.I.A. in Iran—A special report. How a Plot Convulsed Iran in '53 (and in '79)". The New York Times. Retrieved 22 August 2013. ^ "Declassified Documents Reveal CIA Role In 1953 Iranian Coup". NPR. 1 September 2013. Retrieved 27 January 2014. ^ Merica, Dan (20 August 2013). "In declassified document, CIA acknowledges role in '53 Iran coup". CNN. Retrieved 27 January 2014. ^ Corera, Gordon (2 April 2013). "MI6 and the death of Patrice Lumumba". BBC. Retrieved 2 February 2014. ^ DeYoung, Karen; Walter Pincus (27 June 2007). "CIA Releases Files On Past Misdeeds". The Washington Post. Retrieved 2 February 2014. A one-paragraph memo recounts planning for a "project involving the assassination of Patrice Lumumba, then premier of the Republic of Congo. ^ "CIA details Cold War skulduggery". BBC. 26 June 2007. Retrieved 2 February 2014. ^ McDonald, Hamish (12 December 2006). "Canberra's furtive aid in overthrowing Allende". The Sydney Morning Herald. Retrieved 30 January 2014. ^ Suich, Max (20 March 2010). "Spymaster stirs spectre of covert foreign activities". The Australian. Retrieved 30 January 2014. ^ Herbert, David. "Questions over Australian involvement in Chile coup". Special Broadcasting Service. Retrieved 30 January 2014. ^ "The Other 9/11". Special Broadcasting Service. Retrieved 30 January 2014. ^ Anderlini, Jamil (1 June 2014). "Tiananmen Square: the long shadow". Financial Times. Retrieved 2 June 2014. The extraction missions, aided by MI6, the UK’s Secret Intelligence Service, and the CIA, according to many accounts, had scrambler devices, infrared signallers, night-vision goggles and weapons. ^ Schmid, Gerhard (11 July 2001). "On the existence of a global system for the interception of private and commercial communications (ECHELON interception system), (2001/2098(INI))" (pdf – 194 pages). European Parliament: Temporary Committee on the ECHELON Interception System. Retrieved 5 January 2013. ^ Campbell, Duncan. "duncancampbell.org". Duncan Campbell.org. Retrieved 27 September 2015. ^ "An Appraisal of the Technology of Political Control". European Parliament. Archived from the original on 17 April 1999. Retrieved 27 January 2014. ^ "European Parliament resolution on Echelon". European Parliament. 16 March 2000. Retrieved 27 January 2014. ^ "Echelon and the European Parliament". European Parliament. Retrieved 27 January 2014. ^ McKay, Niall (27 May 1999). "Lawmakers Raise Questions About International Spy Network". The New York Times. Retrieved 27 January 2014. ^ Campbell, Duncan (1 June 2001). "Echelon Chronology". Heise Online. Retrieved 19 December 2013. ^ Kim Sengupta; Kathy Marks (Feb 29, 2004). "Blix secrets shared with NZ – reports". The New Zealand Herald. Retrieved 7 December 2013. ^ Tom Allard; Andrew Darby; Marian Wilkinson (February 28, 2004). "Australian spy circle tied to UN bugging". The New Zealand Herald. Retrieved 7 December 2013. ^ a b "UK bugged Annan's office, says former minister". The Sydney Morning Herald. 27 February 2004. Retrieved 18 January 2014. ^ "UK 'spied on UN's Kofi Annan'". BBC. February 2004. ^ "Revealed: US dirty tricks to win vote on Iraq war". The Observer. 2 March 2003. Retrieved 18 January 2014. ^ Bright, Martin (3 March 2013). "Katharine Gun: Ten years on what happened to the woman who revealed dirty tricks on the UN Iraq war vote?". The Guardian. Retrieved 18 January 2014. ^ "Libya: Gaddafi regime's US-UK spy links revealed". BBC. 4 September 2011. Retrieved 20 December 2013. ^ Abigail Hauslohner (Sep 2, 2011). "How Libya Seems to Have Helped the CIA with Rendition of Terrorism Suspects". Time. Retrieved 20 December 2013. ^ "Files show MI6, CIA ties to Libya: reports". The Sydney Morning Herald. 4 September 2011. Retrieved 4 September 2011. ^ Spencer, Richard (3 September 2011). "Libya: secret dossier reveals Gaddafi's UK spy links". The Daily Telegraph. London. Retrieved 3 September 2011. ^ Field, Michael (2 December 2010). "NZ way down the WikiLeaks queue". Fairfax New Zealand. Retrieved 17 December 2010. ^ Nick Hopkins (7 June 2013). "UK gathering secret intelligence via covert NSA operation". The Guardian. Retrieved 22 December 2013. ^ Philip Dorling (June 13, 2013). "Australia gets 'deluge' of US secret data, prompting a new data facility". The Sydney Morning Herald. Retrieved 22 December 2013. ^ Philip Dorling (July 8, 2013). "Snowden reveals Australia's links to US spy web". The Sydney Morning Herald. Retrieved July 8, 2013. ^ Nick Hopkins and Julian Borger (1 August 2013). "Exclusive: NSA pays £100m in secret funding for GCHQ". The Guardian. Retrieved 22 December 2013. ^ Williams, Rob (2 August 2013). "Americans pay GCHQ £100m to spy for them, leaked NSA papers from Edward Snowden claim". The Independent. Retrieved 31 December 2013. ^ Gellman, Barton; Soltani, Ashkan; Peterson, Andrea (November 4, 2013). "How we know the NSA had access to internal Google and Yahoo cloud data". The Washington Post. Retrieved November 5, 2013. ^ "Photo Gallery: Spies in the Embassy". Der Spiegel. Retrieved 22 December 2013. ^ Allard, Tom (4 March 2014). "Australia ordered to cease spying on East Timor by International Court of Justice". The Sydney Morning Herald. Retrieved 4 March 2014. ^ Davidson, Helen (16 October 2013). "NSA files: Australian spies scooped up thousands of email accounts to help US". The Guardian. Retrieved 2 February 2014. ^ Beaumont, Peter (22 June 2013). "NSA leaks: US and Britain team up on mass surveillance". The Guardian. Retrieved 14 February 2014. ^ Colin Freeze (Dec 20, 2013). "Canada's spy agencies chastised for duping courts". The Globe and Mail. Retrieved 27 December 2013. ^ Ian MacLeod (December 20, 2013). "CSIS asked foreign agencies to spy on Canadians, kept court in dark, judge says". Ottawa Citizen. Archived from the original on 22 December 2013. Retrieved 19 December 2015. ^ Stewart Bell (November 25, 2013). "Court rebukes CSIS for secretly asking international allies to spy on Canadian terror suspects travelling abroad". National Post. Retrieved 27 December 2013. ^ a b "Spy agencies silent over funding". Radio New Zealand. 24 February 2014. Retrieved 24 February 2014. ^ MacLeod, Ian (9 January 2014). "European report calls for review of data sharing with Canada over spy concerns". Ottawa Citizen. Archived from the original on 21 February 2014. Retrieved 14 February 2014. ^ "DRAFT REPORT on the US NSA surveillance programme, surveillance bodies in various Member States and impact on EU citizens' fundamental rights and on transatlantic cooperation in Justice and Home Affairs" (PDF). European Parliament. 8 January 2014. Retrieved 14 February 2014. ^ a b c Kelion, Leo (27 January 2014). "NSA-GCHQ Snowden leaks: A glossary of the key terms". BBC. Retrieved 27 January 2014. ^ a b c Cremer, Justin. "Denmark is one of the NSA's '9-Eyes'". The Copenhagen Post. Retrieved 27 January 2014. ^ "Edward Snowden Interview: The NSA and Its Willing Helpers". Der Spiegel. Retrieved 20 October 2013. ^ Martin, Adam (2 November 2013). "NSA: Germany Was 'a Little Grumpy' About Being Left Out of Spying Club". New York (magazine). Retrieved 27 January 2014. ^ Passenheim, Antje (22 November 2013). "US lawmakers push for German entrance to Five Eyes spy alliance". Deutsche Welle. Retrieved 27 January 2014. ^ "Israel cannot ignore damage caused by Trump's Russia leak". Ynetnews. May 18, 2017. ^ Dorling, Philip. "Singapore, South Korea revealed as Five Eyes spying partners". The Sydney Morning Herald. Retrieved 27 January 2014. ^ "Japan lends its vision to 'Five Eyes' intelligence alliance". Jan 10, 2018. Retrieved Feb 6, 2019. ^ "Five Eyes intel group ties up with Japan, Germany, France to counter China in cyberspace". Feb 4, 2019. Retrieved Feb 6, 2019. ^ "Exclusive: Five Eyes intelligence alliance builds coalition to counter China". Oct 12, 2018. Retrieved Feb 6, 2019. ^ Rensfeldt, Gunnar (11 December 2013). "Read the Snowden Documents From the NSA". Sveriges Television. Retrieved 14 February 2014. ^ "The Five Eyes Fact Sheet - Privacy International". ^ "NSA asked Japan to tap regionwide fiber-optic cables in 2011". The Japan Times. 27 October 2013. Retrieved 27 January 2014. ^ Barton Gellman (24 December 2013). "Edward Snowden, after months of NSA revelations, says his mission's accomplished". The Washington Post. Retrieved 25 December 2013. Taken together, the revelations have brought to light a global surveillance system that cast off many of its historical restraints after the attacks of Sept. 11, 2001. Secret legal authorities empowered the NSA to sweep in the telephone, Internet and location records of whole populations. ^ Norton-Taylor, Richard (17 February 2012). "MI5 spied on Charlie Chaplin after FBI asked for help to banish him from US". The Guardian. ^ Douglas Stanglin (17 February 2012). "British spy files show FBI efforts to ban Charlie Chaplin". USA Today. ^ "The Charlie Chaplin MI5 files uncovered". BBC. 17 February 2012. Retrieved 18 January 2014. ^ Campbell, Duncan (25 July 2000). "Inside Echelon". Heise Online. Retrieved 19 January 2014. ^ "Ex-Snoop Confirms Echelon Network". CBS News. 24 February 2000. Retrieved 19 January 2014. ^ Hyatt, Michael S. (2001). Invasion of Privacy: How to Protect Yourself in the Digital Age. Washington, DC: Regnery Publishing. p. 68. ISBN 0-89526-287-8. ^ Aislinn, Laing (9 July 2013). "British intelligence 'birdwatchers spied on Nelson Mandela's hideout'". The Daily Telegraph. Retrieved 21 September 2013. ^ Starkey, Jerome (10 July 2013). "Nelson Mandela 'was spied on by MI6 birdwatchers'". The Times. Retrieved 21 September 2013. ^ Johnston, David (10 June 1990). "C.I.A. Tie Reported in Mandela Arrest". The New York Times. Retrieved 18 January 2014. ^ Stein, Jeff (12 May 2013). "The Day Mandela Was Arrested, With A Little Help From the CIA". Newsweek. Retrieved 18 January 2014. ^ Hanson, Christopher (13 August 1982). "British 'helped U.S. in spying on activists'". The Vancouver Sun. Retrieved 30 November 2013. ^ "'UK aided spy check'". Evening Times. Glasgow. 13 August 1982. Retrieved 30 November 2013. ^ Shane, Scott (2 November 2013). "No Morsel Too Minuscule for All-Consuming N.S.A." The New York Times. Retrieved 21 January 2014. ^ Cohen, Adam (21 September 2006). "While Nixon Campaigned, the F.B.I. Watched John Lennon". The New York Times. Retrieved 27 October 2013. ^ Gumbel, Andrew (21 December 2006). "The Lennon Files: The FBI and the Beatle". The Independent. Retrieved 27 October 2013. ^ Norton-Taylor, Richard (21 February 2000). "MI5 sent file on Lennon to help US investigation". The Guardian. Retrieved 19 January 2014. ^ Redfern, Nick (2007). Celebrity Secrets Official Government Files on the Rich and Famous. Pocket Books. pp. 191–192. ISBN 978-1-4165-3846-2. ^ Aderet, Ofer (20 December 2013). "U.S., British intelligence spied on former Prime Minister Olmert, Defense Minister Barak". Haaretz. Retrieved 21 January 2014. ^ Brissenden, Michael (18 Nov 2013). "Australia spied on Indonesian president Susilo Bambang Yudhoyono, leaked Edward Snowden documents reveal". Australian Broadcasting Corporation. Retrieved 13 December 2013. ^ McDonald, Hamish (21 November 2013). "Spying on President Susilo Bambang Yudhoyono's wife a step too far by ASD". The Sydney Morning Herald. Retrieved 19 January 2014. ^ McGregor, Richard (20 November 2013). "Australia's Abbott has his Merkel moment". Financial Times. Retrieved 21 January 2014. ^ "Cover Story: How NSA Spied on Merkel Cell Phone from Berlin Embassy". Der Spiegel. 27 October 2013. Retrieved 19 January 2014. ^ "US bugged Merkel's phone from 2002 until 2013, report claims". BBC. 27 October 2013. Retrieved 18 January 2014. ^ Campbell, Duncan; Cahal Milmo; Kim Sengupta; Nigel Morris; Tony Patterson (5 November 2013). "Revealed: Britain's 'secret listening post in the heart of Berlin'". The Independent. Retrieved 19 January 2014. ^ Loeb, Vernon (12 December 1998). "NSA Admits to Spying on Princess Diana". The Washington Post. Retrieved 18 January 2014. ^ "Top secret US files could hold clues to death of Diana". The Guardian. 11 January 2004. Retrieved 18 January 2014. ^ Allen, Nick (9 January 2008). "Diana's Squidgygate tapes 'leaked by GCHQ'". The Daily Telegraph. Retrieved 18 January 2014. ^ "Court says Kim Dotcom can sue New Zealand spy agency". BBC. 7 March 2013. Retrieved 19 January 2014. ^ Quilliam, Rebecca (29 August 2013). "GCSB spying illegal, but no charges laid". The New Zealand Herald. Retrieved 18 January 2014. ^ "No charges laid over GCSB's illegal spying of Dotcom". Television New Zealand. 29 August 2013. Retrieved 18 January 2014. ^ "John Key apologises to Kim Dotcom". Television New Zealand. 27 September 2012. Retrieved 18 January 2014. ^ "NSA hacked Al-Jazeera and Russia's Aeroflot – report". Russia Today. Retrieved 23 October 2013. ^ Staff (31 August 2013). "Snowden Document: NSA Spied On Al Jazeera Communications". Retrieved 31 August 2013. ^ a b c "'Follow the Money': NSA Spies on International Payments". Der Spiegel. Retrieved 23 October 2013. ^ a b c d "New NSA leaks reveal US, UK spied on top officials in 60 nations". France 24. Retrieved 20 December 2013. ^ ROMERO, SIMON. "N.S.A. Spied on Brazilian Oil Company, Report Says". The New York Times. Retrieved 9 September 2013. ^ Ryan Gallagher. "New Snowden Documents Show NSA Deemed Google Networks a "Target"". Slate. Retrieved 23 October 2013. ^ Bradley Brooks. "Snowden leaks reveal U.S. spying on Google, Brazil's state oil company: report". The Globe and Mail. Archived from the original on 24 October 2013. Retrieved 23 October 2013. ^ Gellman, Barton; Soltani, Ashkan (October 30, 2013). "NSA infiltrates links to Yahoo, Google data centers worldwide, Snowden documents say". The Washington Post. Retrieved October 31, 2013. ^ "France in the NSA's crosshair : Wanadoo and Alcatel targeted". Le Monde. Retrieved 23 October 2013. ^ Schmitz, Gregor-Peter (20 September 2013). "Cyber Attack: Belgians Angered by British Spying". Retrieved 20 September 2013. ^ Lam, Lana (23 June 2013). "US hacked Pacnet, Asia Pacific fibre-optic network operator, in 2009". South China Morning Post (Hong Kong). Retrieved 25 June 2013. ^ Laura Poitras, Marcel Rosenbach and Holger Stark. "Codename 'Apalachee': How America Spies on Europe and the UN". Der Spiegel. p. 2. Retrieved August 26, 2013. ^ a b James Glanz and Andrew W. Lehren. "N.S.A. Dragnet Included Allies, Aid Groups and Business Elite". The New York Times. Retrieved 20 December 2013. ^ Dafna Linzer. "IAEA Leader's Phone Tapped". The Washington Post. Retrieved 21 September 2013. ^ "Edward Snowden: US government has been hacking Hong Kong and China for years". South China Morning Post. Retrieved 9 September 2013.